Product categories of Mobile Seed Processing Plant, we are specialized manufacturers from China, Mobile Seed Processing Plant, Mobile Seed Cleaning Plant suppliers/factory, wholesale high-quality products of Mobile Grain Cleaning Plant R & D and manufacturing, we have the perfect after-sales service and technical support. Look forward to your cooperation! We offer customized Mobile Seed Processing Plant as client`s specific requirements. It combines several different functions machines on one mobile platform. It is multipurpose machine for grain cleaning and seed treatment. 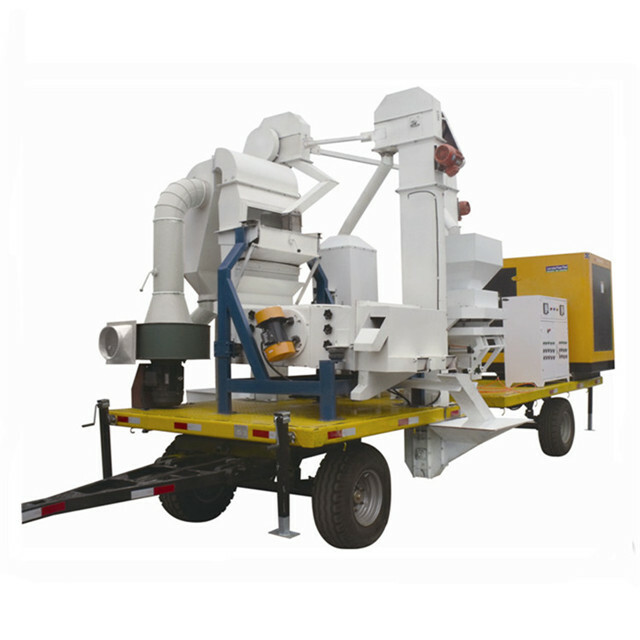 The mobile Seed Processing Plant normally comes with the primary Grain Cleaning Machine, conveyor, and packing machine. Seed Cleaner & Grader, destoner, Gravity Separator, Seed Coating Machine, Bagging Scale System, et can be randomly collocation base on the cleaning requirement. Capacity from 1 ton per hour to 10 ton per hour is available. To process grain seeds directly in the field, the mobile seed processing plant is capable of free mobility, electricity supply, multi cleaning aims. Most mobile grain seed processing plant equipped a diesel generator. It offers whole plant operation driving power. So this mobile plant did not rely on electricity input has no working limitation. Client can take it to filed and remote area for grain seed processing. Mobile Grain Processing Plant has a control panel, it convenient for operator run all the machines. Grain seed processing plant is fit for all cereals, pulses, oil seeds, spices, forestry seeds, including wheat, maize, barley, paddy, soybean, sunflower seeds, chickpea, etc. 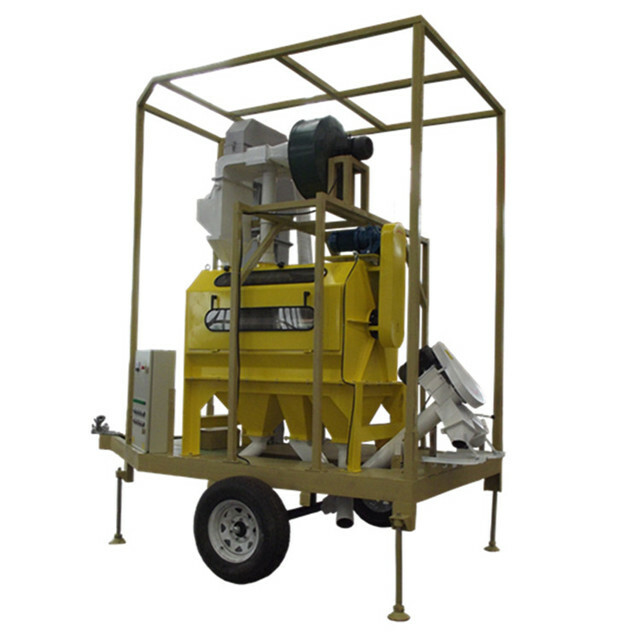 This mobile seed processing cart consists of Bucket Elevator , drum type precleaner, seed coating machine, dust cleaning system, power control box. Customer prefers a simple machine combine cleaning, seed treating. We design this for him. It is 2 ton per hour. Firstly, grain seeded are fed from elevator hopper and delivered to drum pre cleaner. The drum type precleaner is double sieve layers, which is used to remove the big size impurity and small size impurity. 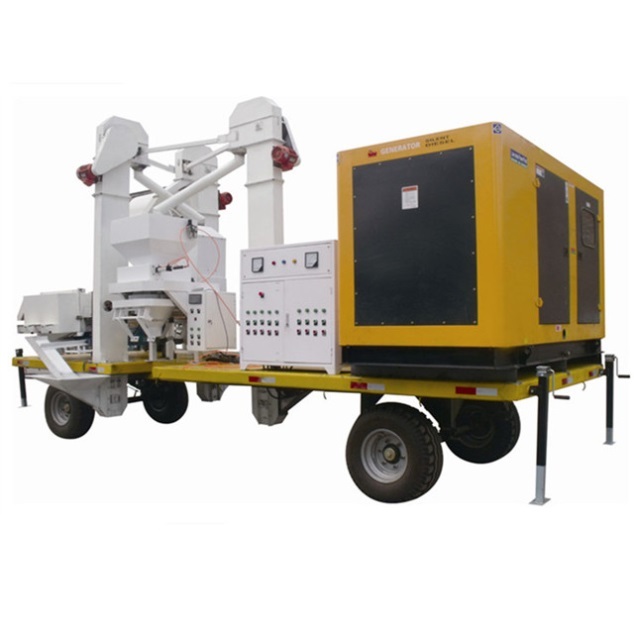 This mobile seed processing plant equipped with dust cleaning system to remove the dust, light impurity by air cleaning. After cleaning, seeds go through seed coating machine for chemical treating. This is 5 ton per hour mobile seed plant. It consists of Seed Cleaner , seed coating machine, Bagging Scale , diesel generator. Grain seed are fed from seed cleaner elevator. In seed cleaner & grader, the light impurity, big impurity and small impurity are separated. Then the seeds are taken to Seed Treater for chemical film coating. Finally coated seeds are transferred to bagging scale for weighing and packing. It matched diesel generator, which can ensure the power supply.